A brick or stone veneer is an application of brick or stone to the exterior of a house as a means of protection and a decorative device. Veneer is applied one brick or one stone thick, and people usually have it only on one section of their wall as an accent. However, it also common for an entire house to use Brick or Stone Veneer all the way around. Regardless of what percentage of the house the Veneer covers, it will stretch all the way down to the ground. Brick ties attach a Veneer to wall sheathing. For a long time, brick was considered too expensive a material to be used in everyday residential construction. However, because of the development of mortarless brick, the price of brick has fallen sharply. So that the Veneer won’t crack, the brick ties holding it to the wall sheathing expand and contract with the wall frame. Also, an L-shaped metal piece underpins the entire structure to ensure that water doesn’t seep up and damage the Veneer. So water won’t be trapped within the Veneer, weep holes are present in the bottom to allow water to slowly escape. 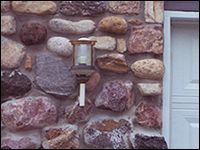 Brick and Stone Veneer is probably the best type of protection from moisture due to rain. Spalling is the name for the crumbling and flaking of Veneers. The two places this happens most are where one section of wall meets another at a corner and at the bottom of the wall. This is most likely because water cannot escape from the weep holes. To prevent this, make sure that water is able to escape the structure. You should clear debris from right underneath the Veneer. Vines growing on the wall of a house also can weaken a Veneer and cause spalling. This vegetation weakens mortar with its grip and keeps moisture on the wall itself. Whenever spalling occurs, make sure it’s patched immediately or irreparable damage to the structure of your siding and your home can be done. Further Information Brick Industry of America There are too many types of shale and clay, variety of units that can be used in combination and the sizes of the bricks for a chart of this type.